Getting Crafty - Let's get cozy! 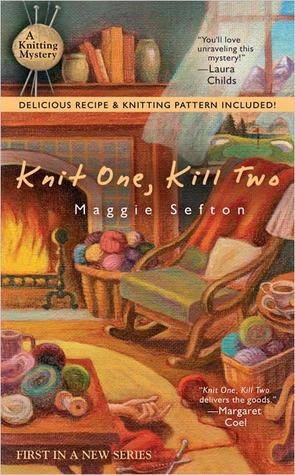 Not only do I like to knit and get crafty, I also love to read and cozy mysteries are right there on top of my list of favorite genres. Now what better way to combine a love for yarn and crafts with my love for books? Kelly Flynn never picked up a pair of knitting needles she liked—until she strolled into House of Lambspun. 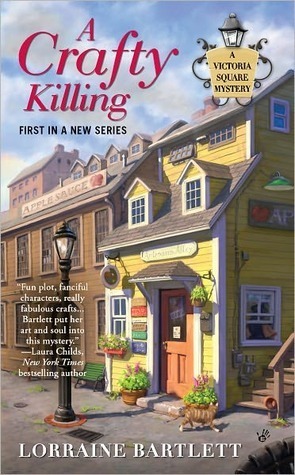 Now, in the first in a brand-new series, she learns how to knit one, purl two, and untangle the mystery behind her aunt's murder. A wonderfully fluffy (pun intended) and light read with plenty of swooning over yarn! The last thing Katie Bonner wanted was to become the manager of Artisans Alley. But when her business partner, Ezra Hilton, is found bludgeoned to death, she has no other choice. Business under Ezra has been faltering-but was it enough to provoke someone to murder? Only Kate can find the answer. A fast-paced who-dunnit that's more about business than crafting, unless you count those capricious artisans! Avery Baker and her boyfriend, Derek Ellis, are flipping a seriously stigmatized house rumored to have ghosts. Soon they'll have even bigger problems-and this renovation project might haunt them forever. 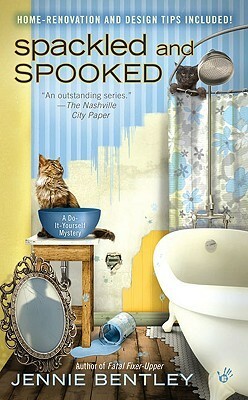 A highly enjoyable but predictable mystery for all those home renovation enthusiasts out there! What crafty novels have you been reading lately? What's it all about? Jocelyn promises that each mystery listing will include 2-3 items, valued at $35, minimum. The listing can be customized a bit so if you have specific preferences -- for example, you prefer gold to silver -- feel free to ask. Content? Needless to say, I was more than happy to have received a total of three items - one necklace, and two pairs of earrings. All of them are in silver which is something I mentioned as a preference when I ordered. Most favorite item? That's definitely a tie between the necklace and the briolettes earrings. Least favorite item? Call me a bit of a nitpicker, but as darling as the little bow earrings are, they have those plastic stoppers instead of normal silver ear nuts which is something that always ends in eye-rolling on my part. Value? Basically you get three pieces for the price of one and you can't argue with that! Verdict? Talk about a lovely surprise! 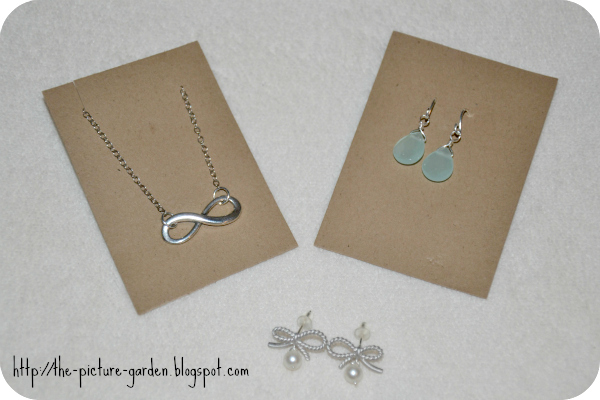 If you like simple everyday jewelry, this grab bag might just be for you too! The Etsy Venture - This order is only flying national! My Etsy basket is always a bit on the full side, but that's ok. This girl needs time to make up her mind before she hits the order button. Being more of a prudent buyer than a spur of the moment kind of shopper has its advantages too. You'd be surprise how often I've been rewarded with unexpected sales on items I've been eyeing for a while. Lately though I came to realize that maybe, in some cases, I should have decided sooner. Preferably before the price hike in postage rates in the US. I've already read about the new and astronomical rates on other blogs, and I also noticed that many sellers have adjusted their shipping rates accordingly. Now imagine my surprise when I revisited my basket and saw that some of the pieces there were suddenly not available anymore. At least not for international shipping. Now why would a US-based sellers decide to only ship nationally from one day to the next? I dare blame it on those high rates, which in some cases practically doubled. Not as though these sudden restrictions make all that much sense. After all, many buyers will pay those higher shipping rates, because they really want to own a certain handmade piece they've laid eyes on. So maybe my assumption is wrong, then again it seems like a bit too much of a coincidence to me. Apart from my basket having been emptied of some seriously cute stuff, the point is that this makes the lives of US Etsy sellers a whole lot tougher. I mean how to go on about it? You can't just swallow part of the costs you pay for shipping simply because you're scared of loosing customers. There is no easy way out here. Especially uninformed buyers will complain, I'm sure of that. Now is there a way around those dreaded shipping fees? Not really. But on a more positive note - I am obviously one step ahead with my own shop plans (despite not living in the US, trust me, shipping fees in Austria are even worse) - selling image file downloads instead of sending actual art prints. Let's face it, it's cheaper (and faster) to have your photo of choice printed conveniently at home, or in lack of a decent printer, at your local print shop. That said, there's still a lot of preparation ahead of me, so my shop may open in April, probably on April 1st. And that, my dear readers, is not a joke! Yarn Tales - I'm the one they call the knitter! Last year I decided to take up knitting again which surprised pretty much anyone who knows me, and that includes myself as well. You see, I haven't been knitting for years, or more precisely decades, and I'd lie if I claimed having fond memories of learning how to knit back in the old school days. In fact, I hated it. Period. Fast forward to autumn 2012. Suddenly I felt this urge to knit. Now how on Earth did that happen, you might wonder? Good question. I'm not certain, but I do have a pet theory that one of my knitting friends rubbed off on me. Obviously she denies it which only makes the whole thing more suspicious. Maybe it was simply time to try myself on something different. Why not stock up on additional hobbies, right? Of course, when I started out I had no idea where this fad might go. I might knit a row or two and come to the conclusion that I still don't like it or I could find myself enjoying knitting a whole lot more than I did as a kid. Luckily it was the latter. For starters I went on a little online shopping spree and was soon the proud owner of a whole lot of yarn and knitting needles in all sizes. Of course I could have just bought one skein of yarn and a pair of knitting needles, but I felt the more supplies the likelier it would be that I didn't opt out in the last minute. Good thinking, eh? After I had everything I thought I needed - obviously I hadn't considered that a box for the knitting needles might be a good idea and it took me an afternoon of knitting to realize that a crochet hook would come in handy too - I was about ready to start. Well, almost. The great thing about the internet is that you can look up anything, including learning how to ride a unicycle, tie a scarf, or in my case, how to knit. Three hours of watching YouTube videos and reading myself through various crafty websites for the rest of the weekend later I was good to go. Obviously I started out with something simple and with the cold season approaching I figured that a loop scarf was just the thing I should knit as my first piece. This particular scarf soon became my favorite thing to knit too. Let's call it my trademark scarf! That one's so simple it practically knits itself. I cast on 25 stitches then knitted away in Seed Stitch (also known as Pearl Stitch) until I used up the whole skein of yarn. The good thing about starting with an uneven number is that you don't have to pay attention to which "side" of the scarf you're on as all rows are *Knit one, purl one; repeat from * to end. If you prefer an even number, you start with row 1 *Knit one, purl one; repeat from * to end; then continue with row 2 *Purl one, knit one; repeat from * to end. Repeat rows 1 and 2. 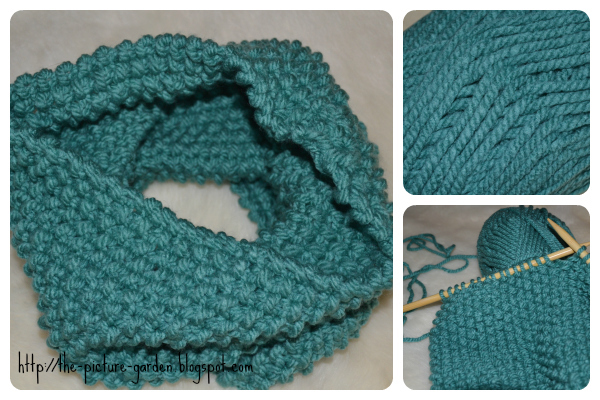 Leave enough yarn so you can use it to sew the cast-on and cast-off edges of the scarf together. By the way, that is where the crochet hook comes in handy! Stay tuned for more yarn tales or rather stories of knitting in straight rows, because I am so not trying myself on cable-knit sweaters ... not yet, anyway. What have you been knitting lately? If there is one thing I love even more than anything handmade then it must be the additional thrill of a surprise. Needless to say I rarely pass by the chance to get my hands on a grab bag aka mystery pack on Etsy. It's not just fun but usually a real good bargain too! What's it all about? 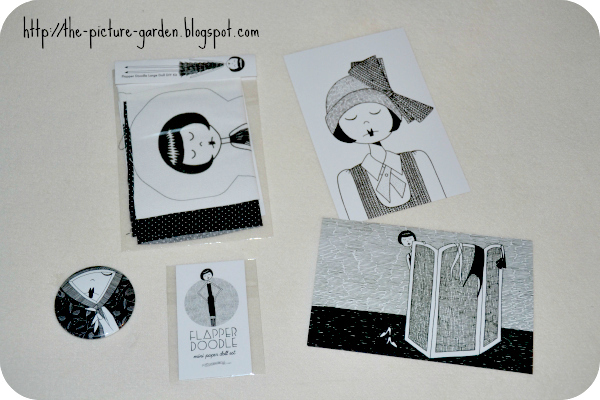 According to the listing each grab bag contains a minimum of $25 worth of flapper doodle goodies!! You might get two mini art print sets, or a set of flash cards! 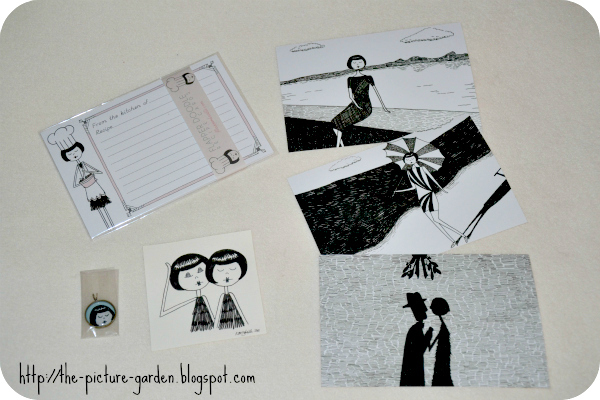 Maybe a paper doll set and note cards, or even an original drawing or painting! It might be worth $25 or $100! Greedy little me had to buy two and as they were individually wrapped I can show them off one by one. Content? The two grab bags couldn't be more different, but I really like that. Of course I'm going to assume that Kate packed them in a way that I would not receive any duplicates. Some of the items included are currently being offered in the shop, while other goodies have apparently been discontinued. Most favorite items? From Pack I it's hands down the original drawing and from Pack II it's a tie between the large DIY doll kit, which is such a cute idea, and the lovely pocket mirror! Least favorite items? In Pack I that would have to be the recipe cards, and that's solely based on the fact that I'm not big on cooking, and from Pack II the small paper doll set which I don't have a use for. Ok, that sounds as if the art prints were caught somewhere in the middle, but trust me I love those too!! Verdict? Let's just say I am awfully tempted to buy a couple more of these mystery packs. If you love the delightful Flapper theme as much as I do, I say go for it! The Etsy Venture - Are we there yet? I mean, are you aware of how much planning goes into opening a shop on Etsy? Well, maybe you do know, especially if you've opened one yourself. Suffice to say, if you want to set up your shop nicely, you need to pay attention to a great many things, starting from creating the shop header (done, at least for now, unless I change my mind again, because to be honest, I have just uploaded the third version, as I deemed the first two not good enough), drafting the shop policies (still adding bits and pieces here and there too), deciding on the first items to be offered (and my oh my, am I being ever the perfectionist with my internal quality control literally going crazy), to name but a few. Folks, trust me, it's way easier to go on a shopping spree on Etsy than opening up your own tent to sell your goods. Just sayin'! On a more positive note I have already created this blog *tadaaa* and parked half a dozen widgets in the side bar that enable those interested to follow me to do just that. Which reminds me that I still need to create a Facebook page. Why isn't that on my list? And where is my list anyway!? Ah, chaos. Can't live with it, can't live without it. Or something like that. So, while I do not know how you happened upon this blog post, let me extend a warm welcome to you. I guess many will just be passing through, but some might stay, and I promise to make your visit fun and inspiring! If you love photography, anything handmade and are generally a crafty person, I'm sure you'll feel right at home in The Picture Garden. So sit back, relax and enjoy my adventures in taking pictures, going on Etsy splurges and knitting a scarf or two! Welcome to THE PICTURE GARDEN! Sharing my adventures in photography, anything that revolves around my love for handmade treasures and just generally being crafty ... coming to you soon!